Dry summers like those that are so common to Arizona can reduce food and water sources for ants, which can drive them inside in search of sustenance. That means they may have taken up residence in your home and made themselves comfortable. Don’t make it easy for ants to get into your home from their natural habitats. Cut back any tree branches or shrubs that touch your home or come near it. Ants can travel along these routes right into your home. Trimming the brush around your home will also protect it during the monsoon season that sweeps through Arizona every year. Heavy rains and winds can knock down branches and cause damage to your home. Trimming limbs will help keep ants and other pests out, as well as protect your home from storm damage. Landscaped beds around your house may look nice, but they can also attract ants and other pests and make it easier for them to get into your house. Eliminate vegetation around your foundation, and make sure the entire area is dry. Xeriscaping is a great choice for Arizona yards, and it can help keep ants away from your foundation, as well. Consider plants that don’t require a lot of water, like succulents, and place other ornamental plants away from your home. Skip the mulch, as well. It can retain moisture and encourage growth, and it provides the perfect home for ants. Food sources are the major attraction for ants. You need to clean up all spills immediately and thorough – especially sugary things that can leave behind a sticky residue. These will be like honey attracting all manner of pests, including ants. Too much of these kinds of spills and you’ll need more than an ant exterminator. Wipe up all surfaces after preparing or eating food, and keep your floors thoroughly swept and mopped. Put all foods in pest-proof containers. That means putting cereal in lockable plastic containers, flour and sugar in sealable canisters, and so on. Even small openings can provide an entrance for ants and other pests. Rinse out all bottles, cans and other packaging before you put them in your trash or recycling bin. Keep your pet food put away in sealable containers, and keep the bowls cleaned. Pet food is actually one of the biggest attractions for ants. Excess moisture can attract ants as much as food. You might have sources of water that you don’t even know are there, such as damp areas under your sink from a leaky faucet or pools of water around your doors because of a broken sprinkler system. If you start noticing ants in or around your home, you should look for sources of water. Call in a plumber if you find any leaks to get them fixed immediately. The sooner you get rid of the water, the sooner you can get rid of the ants. Over time, your home’s foundation and walls can form small cracks or crevices. Not only can these compromise your foundation, but they can also provide entrance points for pests. If you feel confident in your ability to do so, inspect your home for cracks and fill them with caulk. If you don’t know what you are doing, call a contractor to do the work for you. Taking this proactive step will help you keep ants out of your home. Taking all of these steps together can help to prevent an ant problem from forming in your home or can minimize an ant problem that is already present. If ants have already made a stronghold in your house, you will need to contact an experienced ant contractor to eradicate the problem. 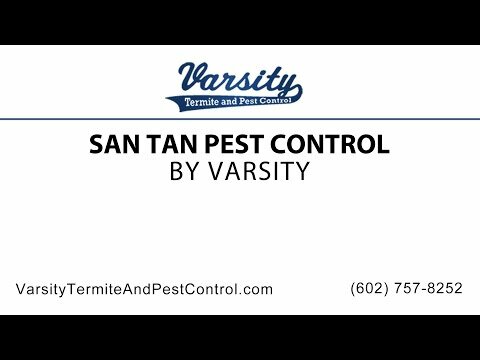 Varsity Termite and Pest Control is the pest control company that Arizona residents trust. We have solutions to get to the bottom of your ant infestation. An exterminator will develop a plan to not only get rid of the ants you have but also to prevent future infestations. We also offer other pest control services in San Tan Valley, including termite control in San Tan Valley, scorpions and more. Don’t let your Arizona home be overrun with annoying pests. Call us today for a consultation.